6VPE (IPv6 VPN Provider Edge Router) | CCIE, the beginning! 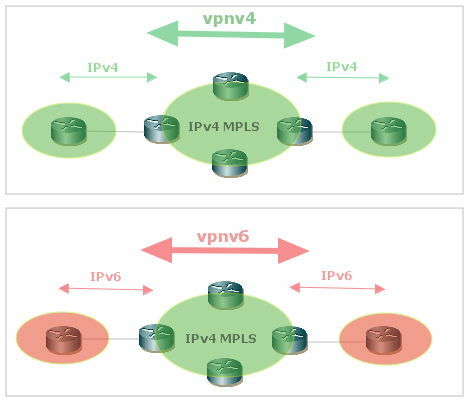 6VPE is an easy solution to connect IPv6 customers through an existing stable IPv4 MPLS infrastructure. All clients have to do is to connect to a Provider Edge (configured with IPv6 VRFs) using IPv6. I hope this post will provide you with a brief and concise explanation about 6VPE. Following the main configuration steps. 22.2.2.2, 33.3.3.3, 44.4.4.4 loopback interfaces are used for MPLS router-id and need to be advertised through Core OSPF. 22.22.2.2, 44.4.4.4 loopback interfaces are used for MP-iBGP neighbor relationships and need to be advertised through Core OSPF. MPLS-LDP establishes back-to-back sessions for label exchange in the control plane and label swapping in the forwarding plane. Just configure MPLS LDP the appropriate interfaces and force a loopback interface for MPLS LDP router-id. Make sure IPv6 routing and IPv6 CEF are enabled. BGP, OSPF, EIGRP, RIP are routing protocols. IPv4, IPv6, IPX, AppleTalk are routed protocol. PE-CE routing protocol is BGP and PE-CE routed protocol is IPv6. PE-PE routing protocol is MP-BGP and PE-PE routed protocol is vpnv6. Core routing protocol is OSPF and the routed protocol is IPv4. RD (Route Distinguisher) uniquely identifies the VRF on the PE and allows having multiple customer VPNs with overlapping address schemas. RT is a BGP extended community attribute (need to be enabled) used to control the installation of exchanged routes between PEs into the correct VRF. MPLS network autonomous system 65234 transits traffic between customer autonomous systems 65010 and 65040. In our case all MPLS routers (P and PE) belong to the same AS. Therefore we need to configure next-hop-self on each PE; otherwise customer prefixes will be visible in BGP table with unreachable next-hops. Another solution is to enable MPLS IP on interfaces facing clients to include them in MPLS updates, then don’t forget to filter LDP(UDP 646),TDP(TCP 711) traffic with the clients . The offline lab provides you with more information about the network behavior and its states in different test cases. An extensive range of commands is provided. I hope you will find it useful. Suggestions and critics are welcome. thanks for this post, was really good. I knew how to do this on ipv4, however, I didn’t know the concept was very similar for IPv6. Thanks.